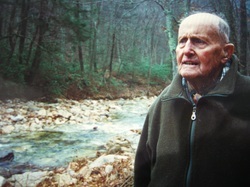 Ernie Dickerman, the "Father of Eastern Wilderness," was deeply involved with VWC for decades before his death in 1998. Ernie helped draft early texts of the Eastern Wilderness Act and lobbied Congress. Later he joined The Wilderness Society staff, building grassroots support for wilderness designation and wrestling with the land management agencies. He retired in 1976 to Virginia, where he became part of the backbone of the VWC and was constantly consulted on a variety of wilderness planning and strategy issues. Ernie donated his papers to Special Collections in Carrier Library at James Madison University. Read Ernie's "History of Virginia Wilderness Committee" (1996) and his 1989 essay, "In Celebration of a Quarter Century of the Wilderness Act." After Ernie died in 1998, Jim and Bess Murray put together Ernie Dickerman, 1910-1998: A Tribute, The Wilderness Society, 1999. As Editor Bess Murray said, it is a collection of "contributions long and short, funny and sad, light-hearted and serious, from colleagues, friends and family." The full-text is available below. More recently, in 2012, Past President and long-time Board member Jim Murray wrote "The Virginia Wilderness Committee: History and Accomplishments".